With the 2017 regular season now in the past, the American Athletic Conference named its award winners on Wednesday afternoon. To the surprise of no one, UCF saw multiple awards come its way. Sophomore quarterback McKenzie Milton was named the AAC Offensive Player of the Year. In 11 games, he threw for 3,301 yards and 30 touchdowns to just six interceptions. On the ground, he added 429 yards and six touchdowns. 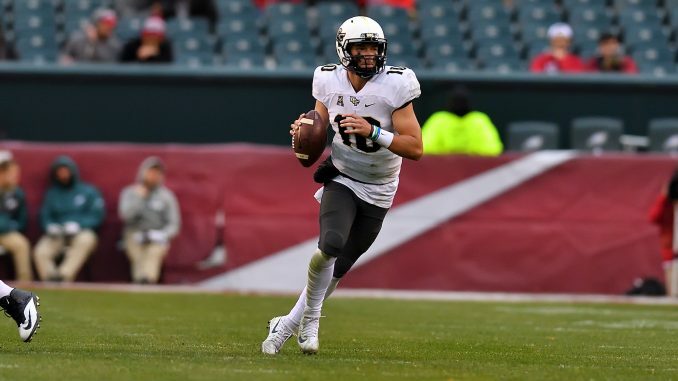 The Hawaii native is the second Knight to win the AAC offensive award, as current Jacksonville Jaguars quarterback Blake Bortles won it in 2013. Running back Kevin Smith won Conference USA Offensive Player of the Year in 2007. Amidst rumors and speculation about his potential departure, UCF coach Scott Frost was unanimously chosen as the AAC Coach of the Year. Frost led the Knights to an 11-0 regular season in just his second year in Orlando, calling plays for the nation’s top offense. He became the second UCF coach to receive the honors, joining George O’Leary (2013 for AAC, 2005, 2007 and 2010 in Conference USA). The Knights also dominated the all-AAC first team, with a record nine players being selected. Representatives from the offense were Milton, seniors Aaron Evans and Jordan Akins, as well as sophomores Adrian Killins and Jordan Johnson. For the defense, it was junior transfer Mike Hughes, senior Jamiyus Pittman, junior Kyle Gibson and redshirt senior Shaquem Griffin. Griffin was a unanimous selection. The second team was full of Knights as well, with seven making it. On offense, it was redshirt junior Tre’Quan Smith and junior Wyatt Miller. Defensively, sophomore Trysten Hill and redshirt senior Chequan Burkett were honored. UCF took all three second-team spots for special teams. Redshirt juniors Matthew Wright and Mac Loudermilk took the kicker and punter spots, respectively, while Hughes received honors as the second-team kick returner. The Knights will look to add to their impressive season on Saturday afternoon when they host Memphis in the AAC Championship Game. Kickoff is set for 12:00 p.m.